Beannachtaí na Féile Pádraig ort! Seachtain na Gaeilge atá ann agus táimid ag céiliúradh anseo i Scoil Bhríde. 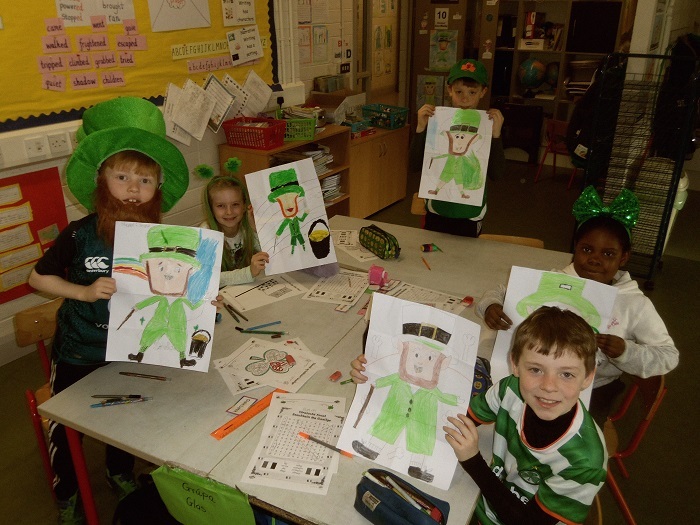 It’s Seachtain na Gaeilge and we here in Scoil Bhríde have been marking the occasion with lots of activities around the school. There has been much artwork, singing, seanfhocail (sayings), a Céilí Mór in the yard, Irish dancing by Múinteoir Holly’s dance class, tin whistle playing by Múinteoir Teresa’s music group and a trad session in the foyer by Múinteoirí Niamh, Marese, Liam and Niamh. You can check out the video and some more pictures below! Here are Múinteoirí Niamh, Marese, Liam and Niamh playing a few tunes for us in the foyer!